Keeping your page stealthy (even if you didn’t know you were doing it): If you have created your page correctly, any person — whether a Facebook user or not — should be able to type in your URL and see your page. Now for the non-Facebook user or for the user who’s not logged in, it means you won’t get any engagement, and they don’t do you much good when it comes to reach, but as long as they can see the page, it could lead them to liking it and then becoming an active followers down the line. But that ain’t happening if they can’t find you! 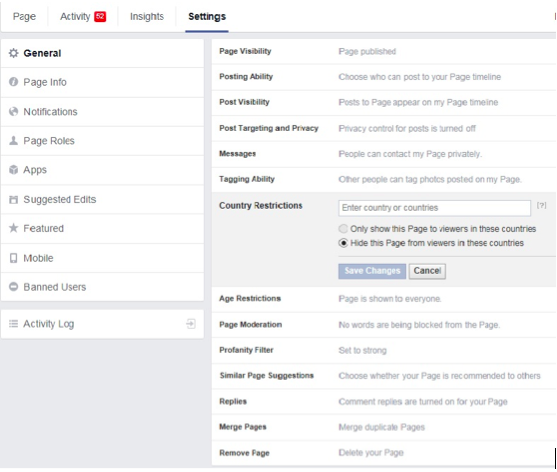 On your settings page, take a look under, “who can see my page.” If you have it set to anything other than “anyone,” then you’ve just slammed the door on all those Facebook-a-phobics or non-logged-in ninjas checking out Facebook from work. Posting random stuff: Who doesn’t love a good meme or the latest Grumpy Cat photo? But when you pollute someone’s News Feed with pictures/videos/graphics that bear no relation to your business, all you’re really going to do is irritate them and make them question your sanity. Overposting: Unless you really have something to say that is relevant from a moment-to-moment perspective (your big sale on widgets only has X hours left, or you’re nearly sold out of the new Widget CS that everyone is dying to get), or you’re offering breaking news (and no, not the “RIP Insert Celebrity” kind), then more than three or four posts per day is just spamming. And nobody likes spam (other than Monty Python enthusiasts). So knock it off! One good way to figure out how/when to post is check out Facebook page insights. You can see when people are looking at your page and tailor your posts to coincide with your high traffic times. Poor engagement: This isn’t about reach, it’s about your audience and how to respond to it/interact with it. No matter how well you run your business, you are going to occasionally run into people who are not happy with you. And the thing about people who are unhappy is this: They’re loud, and they often have WAY more free time to “debate” things than you do. And you shouldn’t debate things with them — you mustn’t, actually. Debating is validating AND it makes you look petty and argumentative. You’ll certainly increase your reach if you’re a jerk, but not in the way you want — and not with the followers you want. Readers: What would you add to this list?